Just in time for Easter: autumn inspired socks! Pattern: Uptown Boot Socks by Jennifer Appleby from the Favorite Socks collection; originally published in the Winter 2003 issue of Interweave Knits. I knit the medium size without notable modifications. Needles: Susan Bates US 1 dpns, set of 5. These socks were one of those wonderful projects that worked out in every aspect, from the very beginning. The yarn can only be described as delectable – soft, springy, and with a wonderful sheen. The colorway is luscious and interesting without being overwhelming. 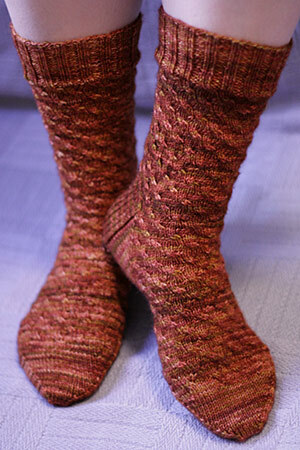 The yardage is generous – 8 grams remain after knitting socks to fit a woman’s large foot. The pattern is simple to knit, but engaging to watch. What more can you ask for?!? OOOH! Those are just lovely! Those are gourgeous. I just ordered this book…can’t wait to paw through it! Beautiful, and a perfect fit. Oooh! Lovely. I just started them in sea wool, so I’m pleased to hear how well it all worked out for even the most discerning of knitters. They’re gorgeous! I was thinking of using this sock pattern for my sock pal last year but decided not to. These will definitely have to become a pair for me. They look great! I love the colors and non-pooling. The colors are wonderful. I think you sold me on this sock. I looked through this book last night and thought about them, but then pushed the thought aside. I don’t know what it was- perhaps the photography. Perhaps the suggestion of wearing them with sandals, which is almost always an immediate turn-off. Interweave has definitely “come along” in its photography lately- your photos represent the sock in a far superior manner. In my humble opinion, naturally. Such a great combination of pattern and yarn, they compliment each other so well. Looks like this pattern will move up on my to-do list. Such beautiful socks. I really like that colorway too. I was wondering if it was discontinued too, as I didn’t find it on the website. Magnificent! Those lovely colors are appropriate for any time of year. My copy of this book arrived last week, and I am now on sensory over-load. So many wonderful patterns to knit, and so little time (with a full-time job and other projects already otn). Uptown Boot socks are now definitely on my list to do, along with several others! Your photography is really excellent. As someone who uses autumn colors year round; I’m in love with the socks. It’s good to hear praise for the pattern since it is on my short list. Wonderful socks! I love all those subtle cables running all over. Wear them with happy feet! Very pretty colors, for any time of the year! Beautiful! I’ve been planning to knit a pair of these myself; thanks for providing an additional visual of what the pattern looks like knitted up! lovely! Just out of curiousity, how many pairs of socks do you think you’ve made? Beautiful color! I have been thumbing through that book, thinking about what to start for my 2nd pair of socks. absolutely gorgeous! i love that colorway with the pattern! OMG I love the colors in those socks!!!!! I searched high and low for the Russet colorway but couldn’t locate it. And I’m usually quite good at finding things on the Internet. What Ms. Frick said: you really do these patterns justice with your photography. Thanks for putting yet another “I want that” on my list! Beautiful! I really must get my hands on some of that fabulous sock yarn. Your socks are lovely! I love everything about them. The color the pattern. I hope you get to enjoy them for a good long time! Spectacular color and very nice knitting there! I emailed Kathryn at Fleece Artist and she told me the colourway was called Madder. None of the normal e-tailers are stocking it at the moment, but Knitty-Noddy special orders from them all the time. I’ve already placed an order! Beautiful! I guess I didn’t notice them in the book!?! I like the understated cabling—and the color, too! Fantastic socks! 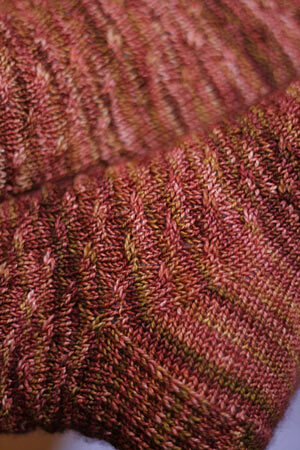 I have some FA merino in Ruby that just might have to become those socks. Glad you enjoyed the yarn, it’s one of my favorites. Very sweet! The colors are amazing and the pattern compliments the colors. Great pictures, especially the second one. Beautiful job on the socks! I love that pattern. Yes, those pictures are amazing, but I think it’s the description that’s going to make me go out and knit a pair. How could I resist? And I haven’t even narrowed down my pattern for my lace scarf. O Grumperina, you’re getting me into trouble! Another great job! They are absolutely gorgeous and the color is perfect for the pattern. Love the socks! The pattern looks great in that colourway! Those are just lovely. I just ordered this book and am eagerly awaiting it’s arival. I’ve seen so many of the patterns on the blogosphere. Can’t wait to share my own pics! Very pretty! I just got my IK Favorite Socks and those are definitely going to be the first pair I knit! Very nice socks, I’ll have to knit that one soon. It looks very nice with the russet yarn. Lovely colorway and what a sweet little pattern. Super original post, but those are pin up socks, really, truly. 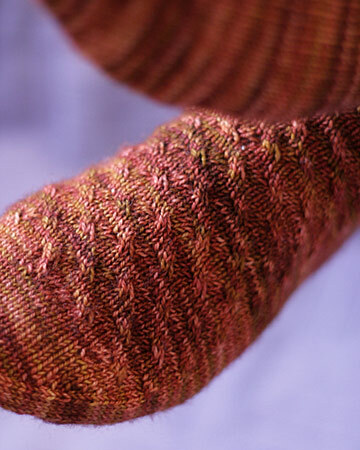 You do such a good job of marrying variegated yarns to perfect patterns. I can’t wait to try some Fleece Artist someday. Just beautiful – love the colourway, and your knitting is fabulous! Those autumnal socks turned out beautifully. The colorway is so rich – I love it! Beautiful – I want to make a pair – and great photos! You mention the sheen of the socks — I got some Claudia Handpaint which had a delicious sheen — until I washed them, and the sheen is no more. Is there any way to keep the sheen around? GOEGEOUS!! The way the weather is going here, I’m getting in the mood for autumnal colors myself. GORGEOUS!! The way the weather is going here, I’m getting in the mood for autumnal colors myself. I loved that colorway when I first saw it on your blog a couple weeks ago. I’ve been searching for it ever since and yes, I think it must be discontinued, which makes me sad, although I did get a delicious burgundy,wine,rose,rust colorway while traveling through Steamboat Springs, CO at Fiber Exchange. Those socks are beautiful. I also bought the book, thanks to your blog. IWP should be giving you kickbacks!! I saw your pattern in the Spring issue too! Good Job! It’s always so nice to see your finished socks and these are ones of my best from you. Thank you. Ooooh! Those are really lovely. And that yarn…!! I want some. I LOVE how these turned out. Can’t wait to start a pair of my own: that book has given me a new lease on knitting socks. I had almost gotten to the point of never wanting to knit another sock, and voila! i am ready to do more! Those might just inspire me to go back to my socks again and continue my stash busting!!! I love how the pattern looks with the colors in the yarn!! very cute! I think the colorway is beautiful! I’ve been eyeing that pattern for a week now. Love the socks, love the yarn, what’s more to be said? Well, it *is* autumn down here, so they’re seasonally appropriate to more than half the world (as well as just plain beautiful!). That colorway is so beautiful! And the pattern brings it out perfectly. Just gorgeous! Gorgeous socks, that is a spectacular colorway. Oh, I really like those. I have knit socks in the Fleece Artist Merino and I agree with your assessment of it. I have only knit plain socks so far, but I keep hearing great things about that book. I might have to branch out. so…since they’re merino, I’m assuming your Grandmother will love them…right? I just ordered my first Fleece Artist from the Loopy Ewe this week! This makes me very excited to knit it!! !